The Art of Craft Exhibit at the Summerlin Public Library through December 6, 2015. "Welcome guests, members and library friends,Thank you for joining us on an evening that is so very important to The Las Vegas Crafters Guild. I stand here with both pride and humility as the representative of an extraordinary group of talented and diverse artisans. Arts and Crafts have been a vital part of human civilization virtually from the beginning of its existence. Historians, archaeologists and museum patrons prize the carvings, pottery, jewelry, tapestries and clothing to name just a few of the treasures that have been unearthed. These days the word crafts all too often brings to mind those plastic lanyards that we all made in summer camp or those old musty, afghans at the back of the closet. 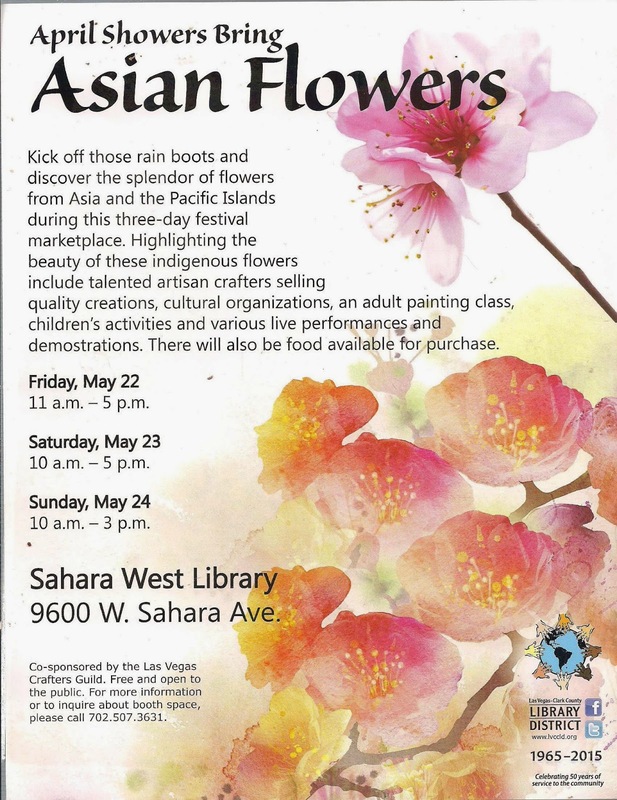 Thank you to Bea, Darren, the Las Vegas Clark County Library District and in particular The Summerlin Library for recognizing that arts and crafts are no less beautiful, practical and valuable to our community as are those that are considered fine arts. The Las Vegas Crafters Guild has become a family. As such, we encourage, support and commiserate. We remind each other that there are no mistakes; only opportunities for embellishment. Each member has inspired me and taught me that not only is okay to trust my vision but that is right to value my work. It is my hope that those who visit this gallery over the next two months will be similarly inspired by the art of craft. Again, thank you for joining us, but I do want to offer a special thanks to Guild Vice-President, Gerry Hackney, who has been tireless in bringing this show to fruition even when members missed deadlines.Over the past six years, Gerry has been instrumental in building the Guild's strong, positive public image. Gerry, thank you does not seem to be enough, but please accept this small token of our love and appreciation. The Las Vegas Crafters Guild, a 501(c)(7) organization, was created in 2006 to: Develop a fellowship among craftspeople; Support the 'Art of Craft' through exhibitions, education and public awareness; Promote the development and appreciation of craftspeople and their work; and Develop and facilitate a market for crafts. 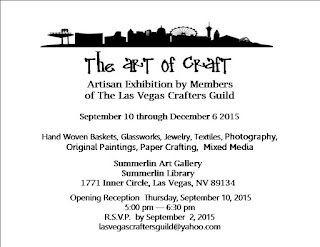 All members of the Las Vegas Crafters Guild are juried and their art must be handmade. Our members clearly prove that crafters come from all walks of life. We have a police officer, grocery store manager, a bail bondswoman, real estate agents, an interior designer, eyeglass technician, teachers, engineers, retirees and a farmer too. Likewise, our membership reflects the diversity of the Vegas Valley community and we hail from places ranging from California to New Hampshire with Hawaii, Wisconsin, Texas, North Carolina and even the Middle East represented. While our primary mission is to support and showcase the handmade work of local artisans The Las Vegas Crafters Guild also proudly supports community organizations working to make our world a better place. Our members regularly provide in kind donations for raffles and auctions while the Guild makes quarterly monetary donations to non-profits supported by our members. The Little Miss Hannah Foundation, NSPCA, The Red Cross, The Caring Place, Best Friends and Aid for AIDS of Nevada are but a few of the groups that we have touched. The Guild holds meetings on the fourth Thursday of each month (excluding August, November and December). After a brief business agenda, we have programs, workshops and educational speakers. In addition to business professionals representing agencies from the Post Office to SCORE, we have also had the pleasure of welcoming world renowned clay artist and Las Vegas local, Lisa Pavelka, who is an honorary Guild member. While we certainly strive to provide our members with the tools to grow their businesses and their craft, we also enjoy our fun. We often host contests to challenge our creativity with non-traditional materials. Perhaps our most memorable was the Easter grass. The winner created a beautiful t-shirt by fusing the grass with an iron. 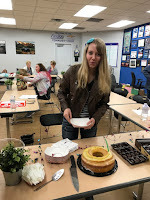 Laughter and much commiseration ensue when we share our “craft fails.” We also host an annual holiday party complete with a white elephant gift exchange as well as a Christmas in July craft supply exchange. Each year the Guild hosts craft show boutiques in the fall and in the spring at The Sahara West Library. All vendors are juried members and present for sale handmade, quality pieces in a variety of craft forms ranging from artisan jewelry to fiber arts and fused glass to candles. All featured items are the original creations of our members. 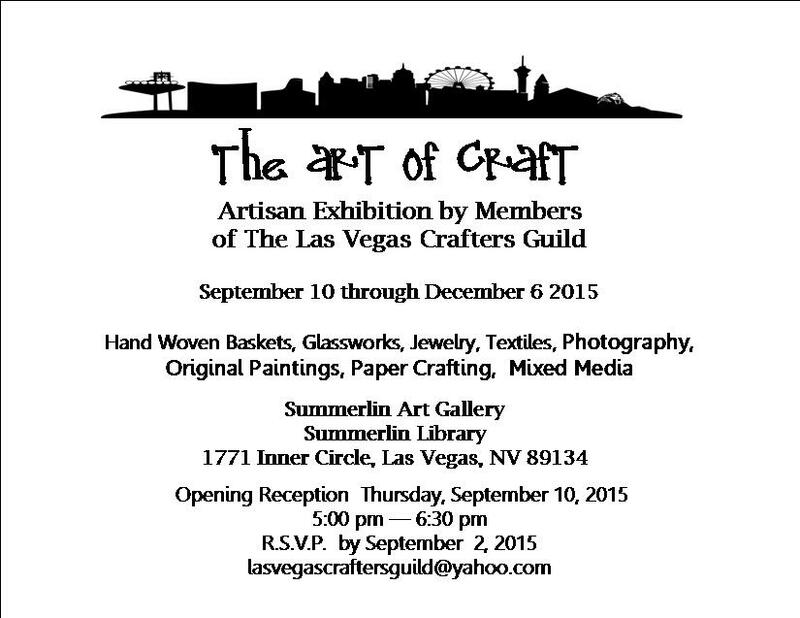 The Las Vegas Crafters Guild is pleased to be featured in a group exhibition of artisan crafts at the Summerlin Library Art Gallery. “The Art of Craft” exhibition will run from Thursday, September 10, 2015 through Sunday, December 6, 2015 with an informal reception September 10th from 5:00 pm to 6:30 pm. The exhibition will feature works from juried members of the guild who are all Las Vegas residents and use a variety of different mediums. This unique exhibition will include original acrylic Hawaiian themed paintings by Keo Marciel, fused glassworks by Cindi Clark, handwoven baskets by Jeff Murchin, artisan jewelry by Gerry Hackney, Debbie Williams, Lynn Meetz and Merriam Olds, mixed media collages by Fran Ginty, textiles by Mary Beth Zahedi, Diane Davis Garcia and Linda Clark, rock photography on canvas by Michael Hackney and paper arts by Beth Pollock and Norma McAndrews. This exhibition is just a small representation of the many talented and creative members of the Las Vegas Crafters Guild. Merry Christmas! That's right...tonight we will be celebrating Christmas in July. So......here it where you, the members, come in. Go through your craft supplies. You know you have more than you need or could possibly ever use in this or several other lifetimes. Pick something out and wrap it up. We will do a traditional Yankee Swap...just like we do at our holiday party....except tonight we are exchanging craft supplies. Please also bring a dozen cookies. I told you this is going to be a proper Christmas party. We are going to have so much fun. We were so excited and honored when we asked to participate in the April Showers Bring Asian Flowers event hosted by the Sahara West Library. That was last fall and now it's just days away. So many things still left to do but what gets done gets done and oh well to the rest. This event will highlight the different cultures from Asia and the Pacific. Entertainment, food, and cultural activities will take place all three days. As part of this event, members of our guild will be displaying some of their finest work. Skillfully made hand woven baskets, beautiful original fused glass plates and home accessories, handmade hand stitched greeting cards, amazing artisan jewelry, fabric aprons, purses, darling crochet hats and scarves, original photography. embroidered pillows, totes, scented gel candles and more will be available for purchase. So come and enjoy the festivities with your family and friends. Greetings and Welcome to the brand new blogosphere home of the Las Vegas Crafters Guild. This is a year of change for our us, and are looking forward to connecting with the community in a fun and innovative way. We ask that you bear with us as we learn on the job blogging. It is here that you will learn about the talents of our artisans and get a sneak peek of the lovelies that they offer. We will bring you updates about the crafting community here in Las Vegas and keep you posted on the shows and other events in which our members will participate. Hopefully, once in a while we will be able to share a lesson with you. Of course, your feedback is important to us, so post your comments. We will be sure to respond to everyone. Are you a crafter? Well, our blog will give you all the information about our membership requirements.